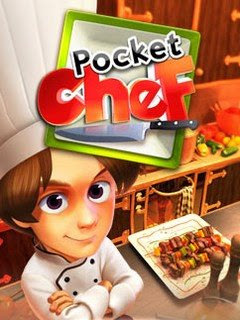 Pocket Chef is simply bridging the gap between a cartoon kitchen and the more realistic cooking environment. You can enjoy to learn how to cook when you want to become a professional chef! I found the different of actions for the key numbers on mobile phone, such as the Chopping ingredients is simple – you do it by moving the knife just the right amount with '6' and '4', then slamming it down with '5'. You stir by building a fast and steady rhythm with '4' and '6', while flipping burgers entails moving the spatula between them at just the right moment before hitting '5' to turn it over. So, it is simple but the food recipes does tend to reduce the challenges to a time crunch! You need to be fast if you want to complete a task! You need to pass all recipes given by a profesional chef if you want go to next level! It is harder when I have successfully learn all recipes, especially from old woman - vege chef! O_O I need to practice to crop lot of vegetables! So that it must get great marks! When you want to cook a dish with used the 'oven', it is very easy~ :P But, my sisters told me that it is not easy compared to other games!! I bought this game costing RM 8.00 only. You can find this game from the ASTRO magazine or any magazines..
20 mini-games to prepare real recipes, from the preparation to the baking and presentation. 33 recipes from all over the world, including different courses and cuisines. 2 game modes and a recipe book available whenever you want to cook in real life. Face 7 charismatic chefs, from your mother to a five-star gastronomical genius. Realistic cooking graphics and sounds. You will actually cook with your mobile!